Friday, I explained my Debbie-Downer spiral into guilty dog owner misery. Wednesday was NOT a good day, and I was feeling like a failure at dog-training, and like I wanted to hunt down that awful Dog Whisperer wannabe and smack him upside the head. I also mentioned the up-swinging mood that I planned to post, and then failed to actually post it. I figured I ought to get it together while the timeline still makes sense. I bounced back from my bad mood, and armed myself for WAR before heading out to take Gwynn and Sadie for a walk on Thursday last week. I would not give in to this doggy failureness, despite being lacking in walk-buddy Doodle (she’s having a blast up north, by the way). I would overcome. And… secret weapon… salmon skin. Also cooked. This is gold. Gwynn gets crazy-eyed at this, and so does Sadie. Gwynn does a run-through of anything he can think of – sit, down, wave, other paw, both paws, roll, attempt to use the Force and take fish skin using the power of his mind. The other dogs in Gwynn’s obedience class try to get close enough to grab the baggie of fish-skins, confusing their owners to no end as to why I’m suddenly awesome. Once I realized how effective this treat was, I started freezing it every time we make salmon for dinner. A slab of salmon is considerably less expensive with the skin on, and it isn’t that hard to cut it off before prepping your salmon. We could eat it ourselves, and I realise that there isn’t anything bad about it, but… it’s shiny and odd, and I’d much prefer to not eat it. Cut the skin off the raw fish – use a large, sharp knife for this, and take your time. Put it on a baking tray with parchment paper on it (to prevent the skin from sticking to the tray), and stick it in the oven (375 Fahrenheit) until it is crispy. Break it into pieces (I cut them to about 1”x 1”) and store in the fridge (short term) or freezer (long term). I break it up in my hand when using it in training, so if you don’t want to have to do this, cut it into smaller pieces. Be warned… your hands will be kind of greasy and smell like fish after you start serving out fishy treats to your dog. Putting hand sanitizer on your fishy hands will make them smell like vodka-soaked fish. these... are much prettier than what I make... 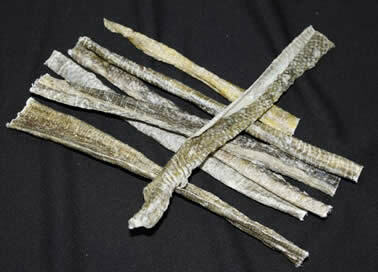 BUT... fish skin treats for dogs all have the same effect, regardless of prettiness. Click on the pic to go to a website that sells these dog-tasty morsels. I loaded my nerdy fanny pack with the Tupperware full of weapons of mass obedience (WMO’s), water, and a ball. I kept Gwynn and Sadie on-leash, walking nicely, for the first 20 minutes in the park (this is after a 20 minute-ish walk to get to the park), and every few steps, I practiced the command that I KNEW they know… but on-leash. Sit. Wait. Retreat a few paces, making them wait. Come. Reward. WMO and affection and verbal praise… I threw everything in my arsenal at them. like that...but twice the dog! It was like practicing a command with a built-in distraction in place. And repeat… many times in a 20 minute period, interspersed with actual walking down the path, and with random sit commands. Basically, my goal was to show them that ‘to come when called is to fill their mouths with morsels of awesome’. I am the candyman, and the pied piper – follow my lead, dogs. I do realise that this should have been followed by working with them like this for a few days, then working like this, but on a long line, then working off-leash and in an enclosed area, then working off-leash in a very distraction-free area. And also, training two dogs at once is not necessarily a wise choice. BUT I knew that they both know this command, and that Sadie always stays quite close to me (and Gwynn stays close to Sadie, because he loves her), and I also knew that if I didn’t let Sadie run at all on this walk, she’d be a hyperactive mess until our next walk, next Tuesday. They were also just about cross-eyed with glee at the WMO’s, so I was hopeful about off-leash training, and thoroughly ignoring the inner voice. The inner voice was describing what happened every single time for the past three weeks that I have let Gwynn off-leash. He left the school-yard, ran across a street and into someone’s back yard. He ate a large portion of a very old-dead-seagull, he ate A LOT of goose-poop and crawled under a picnic table that had two women sitting at it. He ran into someone’s yard while trying to make friends with a cat. He ran into that person’s yard again, a week later, trying to find that cat. And… chasing Sadie. Obviously this one doesn’t apply to Sadie… but Gwynn, mid-chase, stopped… and returned to me. What they weren’t better than? Kitty looked down at Gwynn from his perch of safety, and said "HELL NO, we can't be friends!" 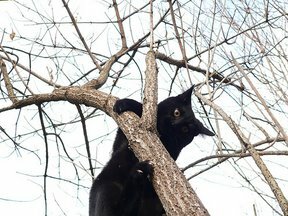 There was a black cat in the woods, and it climbed a tree to avoid meeting Gwynn and Sadie. While Sadie considered the WMOs to be better than a cat up a tree (she has kitty friends at home, so they aren’t as exciting), Gwynn was determined to get a kitty friend. I have NEVER seen a cat down in the creek valley before Thursday. Ever. I even had them doing the Sit… wait while I back up… come practice while they were off-leash. Every time they brought the ball back, in fact. Then they got the double-treat of getting a WMO, and getting the ball thrown again. One woman walking down the path asked me if I was a dog trainer. While I realize I’m nowhere near that good… it was such a morale booster, especially on top of all the successful training practice we were doing. Practice. It needs to happen, or all the success goes away, leaving me wallowing in unhappiness and guilt at my dog-fail-ness. The right treat – find that thing that the dog loves even more than animal carcasses and feces. That is what you should be doing your high-distraction training with. At home, anything I give him seems to count as awesome treat. Positivity – Mr. Snark crushed me with his scorn and derision… why? Because I let a random stranger with no knowledge of how awesome and generally good Gwynn is tell me how sucky I am at life. And I believed him. The positive side of this, though, is that it was enough of a kick-start to make me more focused on doing the necessary steps to work through the training issues we’ve run into. I was still dead-tired, but I was reminded of how much more than just exercise and fun Gwynn needs. I went to sleep early… and will continue to do so while I’ve got all this extra time on my hands (dogless for a week). The shaved roast beef worked fairly well as a WMO; I ran out and am currently using hot dogs. I find as you stated that you really need to be consistent with the training, so I need to get into the habit of training every day. I know what you mean… I need to get into that habit as well… more than just the practice we get by making him sit at intersections and at the door. he needs the stay, and the recall practice. I’m going to have to remember the roast beef next time we do a roast – that would definitely be a WMO for Gwynn! See, I knew you have success with Gwynn. 🙂 It will get better as he grows up too. Good idea on the salmon skin treat. I know when I was doing some obedience with Storm they suggested that I find a treat she could smell to help get her attention. She has never really been motivated by food. Bumpers yes. Food not as much. Salmon skin might have been a good choice as long as it was small enough to not require a lot of chewing. definitely – smelly or at least moist type treats are the best for making Gwynn interested – he knows how they taste, and he can smell them strongly even from a bit of distance. drier treats dont’ have as much of that smelliness to them. I find with the salmon skin, i tear it into barely bigger htan my pinky-nail sized pieces, and Gwynn still pays attention to them and getting more of them. Thanks for the tips on the fish skin – I buy salmon skin treats often from Pet Planet since Moses goes nuts for them. Next time I’ll have to make them myself. Happy to read all has picked up – maybe the shoe will be on the other foot the next time you run into Mr. Snark (gods forbid). Salmon Skin as a WMO- totally brilliant! My pups are sooo bad. I know it’s my fault. It’s hard to train a household of seven, but the puggles have managed it quite nicely. I’m going to give this a shot, thanks! It is amazing how much a dog can improve if they get enough practice at things. Though I find it hard to believe Nautica has space issues (is that a way of saying she snapped at the other dogs? … or just got really uncomfortable with dogs too close to her?… wasn’t sure), considering your previous post about finding one of the ferrets chilling in his cage with him. We saw a woman in the park one day with her ferret on leash (most adorable thing ever! they are like a cross between a giant inchworm and a snake… but covered in fur and a bandit mask – and I mean this in the most ‘AWWWWW’ way, lol), and Gwynn definitely went into the same mode as he does for squirrels and pidgeons – “MUST CATCH SMALL MOVING THING!” I definitely couldn’t have a ferret, i think. Gwynn already kills mice (pounces on them, like a cat), and I’m not willing to risk something that can’t get away from him. Wow. I’m so not a fish person — I was cringing when you talked about baking salmon skin. I can see why dogs would love it, but I think I’d have to vacate my apartment for a week! You’re a good dog owner! fair enough – I’m sure if I didn’t love fish, I wouldn’t ever find myself with fish skin in the house… and Gwynn would never get fish skin treats. But he’d never know what he was missing!